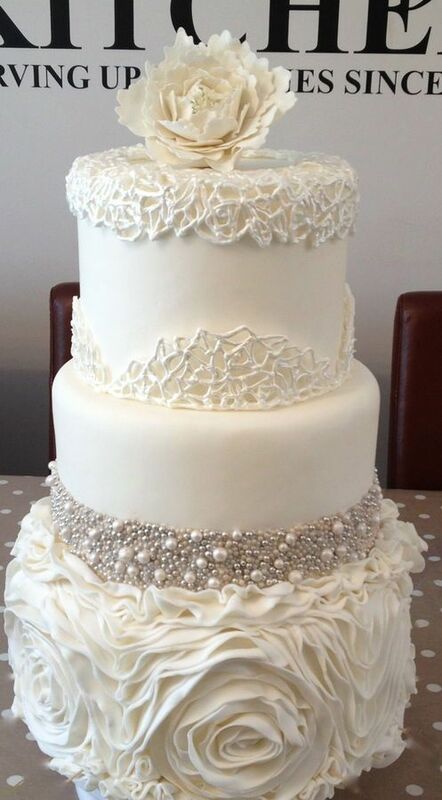 Does anyone know of a tutorial or video on how to do the chocolate collar on the top tier of this cake? Actually, I am assuming it is chocolate. I know a lot of the time Chocolate collars refer the full sheets of chocolate that go around the whole cake, but I didn't know what else to call it. I was thinking royal icing but it could be either. Don't know of a tutorial but I would think you could pipe it on a cake pan larger than the tier, let it dry and lift it off. Might have to put plastic wrap or something over the pan so it will release. Just guessing though. Thanks for your input. I was actually thinking the same thing, I guess i will just have to try it and see if it works. I agree with Deah. Be it chocolate or royal this has definitely been piped over something just slightly larger than the top tier, left to dry then placed on. Actually, I would guess the top cake itself has probably been trimmed down before icing to give it a perfectly smooth finish. In which case, the tin it was baked in would probably be the right size for piping your collar. Definitely cover your tin in cling film (saran wrap, whatever it's called where you are), and make sure it's very smooth, so it's easier to lift off. Better still, if you can get a good smooth covering with nonstick parchment paper, I find that works better than cling film. That is a royal icing cage. It is from Colette Peters class Vintage cakes, modern methods on Craftsy. If you are interested in the class, here is the link http://www.craftsy.com/search?query=vintage+cakes%2C+modern+methods.... I don't know of any free tutorial. I believe the method Katy mentioned is pretty much how it is done. The only thing is if you are using a tin to pipe it, it has to be a size up. I would say about 1 inch so that there is a slight gap all around.